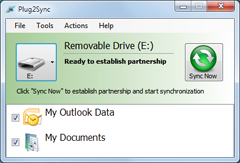 Plug2Sync and Backup: USB PC Sync Software | File Backup | Outlook Sync & Backup. USB PC Sync Software, File Backup, Outlook Sync & Backup. Sync and backup Windows files and folders via external memory devices. Synchronize and share Microsoft Outlook folders*. Sync bookmarks and Internet Explorer Favorites between computers. Real-time synchronization of updates between computer and USB Drive. Real-time file backup. Free Sync and Backup software for files and Microsoft Outlook*. 4Team's Plug2Sync and Backup software is an easy to use, innovative, versatile and time-saving solution for file synchronization, file backup and Outlook sync and backup. This USB PC sync software is an all-in-one sync and backup tool. It combines file sync capabilities with real-time file and folder backup, as well as Microsoft Outlook backup and Outlook synchronization on multiple devices that use Microsoft Windows. Plug2Sync and Backup is designed to be used primarily together with external memory devices, such as USB flash drives, external hard disks, SD cards, or other removable storage devices recognized by Windows operating system. However, the backup features work in the same way together with local drives as well. Whether you want to synchronize files between your PCs, sync Outlook data on multiple computers, backup files as soon as changes are made to them or backup Outlook .PST files, Plug2Sync and Backup is the smart solution that will make things easier for you and keep your data safe. Selective synchronization. Sync and backup any files and folders. Sync Microsoft Outlook folders between PCs: Emails, Contacts, Calendars, Tasks and Notes. Backup Outlook .PST data files. Synchronize files and folders via USB. Bidirectional file synchronization is also known as symmetric file synchronization or file mirroring. Plug in a USB device, for example an external hard drive, USB flash drive, or any other memory device recognized by Microsoft Windows, choose what to sync and press the button to start the data synchronization. Connect the USB device to another computer to sync files between computers. Any changes are detected automatically and synchronized as soon as they occur, while the memory device is plugged in. Real-time file backup via USB. Sync and backup files to external hard disk, USB flash drive or other memory devices. The data is replicated on the external memory device in the original file format and can be opened directly without Plug2Sync and Backup. The automatic real-time backup capability ensures that your files and folders are safe and updated as soon as changes occur. Sync Outlook via USB device. Synchronize your Microsoft Outlook data on multiple PCs via USB memory devices. Synchronize and share Outlook folders between computers, laptops, netbooks or Windows 8 Tablets. Synchronize Outlook emails, contacts, calendars, tasks and notes. Plug2Sync and Backup offers complete flexibility to create Outlook backups which are customized according to your preferences. Backup Outlook .PST files entirely or choose to backup Outlook emails only or just specific Outlook folders. Backup Outlook data on local drives or on USB devices, such as portable external hard disks, USB flash drives or SD cards. Backup and Sync software for Enterprises. Reliable, versatile and cost-effective software solution that can address a wide range of issues. Plug2Sync and Backup can be used to backup data on employees’ computers as well as to share and synchronize data between employees’ computers using the USB drive. Avoid the firewall limitation issues on corporate networks and make file synchronization and Outook folders synchronization easy for employees. A unique tool that will help enterprises improve efficiency among employees and keep enterprise data safe, while also keeping the budget well under control. Synchronize files, folders and Microsoft Outlook data between computers, without having to depend on internet access. Avoid data transfers over slow connections and sync large or multiple files between computers much faster and with maximum data safety, via USB. Plug2Sync is compatible with Windows 8 (32-bit), Windows 7 (32-bit), Vista, and Windows XP. Compatible with Microsoft Outlook 2013, Outlook 2010, Outlook 2007, Outlook 2003 and 2002.